Visiting Marrakech can be extremely exciting as there is so much to do and see in this city and it's surroundings . You can find a number of desert tours as well as excursions from Marrakesh to some lovely sights and places. If you’re planning on visiting Morocco, here is a list of the best desert tours that you can take from Marrakech. Discover some of the most spectacular corners of Morocco on this two day tour. See the ancient Kasbah of Aït Ben Haddou and the Ouarzazate film studios, enjoy a camel ride through the Zagora dunes, and spend one night in the middle of the desert. Enjoy a unique 3 day desert tour ! Together with your guide, you will see spectacular landscapes of Ouarzazate, the door of the desert, the famous Todra Gorge, in the Valley of the Dades. Live like a real Berber nomad, camping in the desert of Erg Chebbi, where you can watch a beautiful sunrise from the dunes. Discover some of the most fascinating landscapes of Morocco along this 3 day desert tour. Visit Fez, an ancient imperial city, and get to know the famous Dades Gorges and the Valley of the Roses. Ride a camel through the Erg Chebbi Desert and wake up between the dunes! 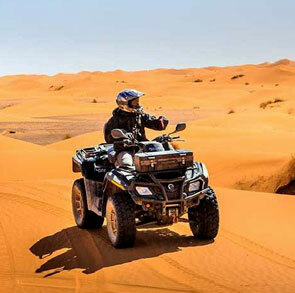 On this 4-day desert tour you will visit the most amazing part of the Moroccan desert and will take in some of the most impressive landscapes of the country. 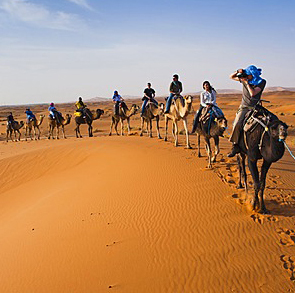 Enjoy a camel ride through the dunes and experience a night in the Zagora and Merzouga desert. An experience you will never forget! Enjoy a unique Moroccan experience. Over a span of 4 days, some sites to see are landscapes of Ouarzazate, it’s Film Studios, The Zagora Desert, the famous Todra Gorge, in the Valley of Dades. Sleep in the Erg Chebbi Desert as an authentic Berber nomad would, and enjoy a spectacular sunrise from the dunes. Planning a trip to Morocco and want to make the most of it? If you will be visiting Morocco you really want to visit the major cities of Marrakech, Ouarzazate and Fes. One of the most ideal and fun ways to visit both these cities on your trip to Morocco is with a day trip from Marrakech to the Sahara desert. This way you not only get to see these two major cities but also get to do a lot of sightseeing and also get to see the desert sunset and sunrise while spending the night under the stars and getting immersed into the local culture. And if there is just one thing you definitely cannot miss out on when you are visiting Morocco that would be trekking through the desert on a camel’s back. The Marrakech to Desert tour is such a spectacular tour that it has been rated the #1 tour offered in Morocco. 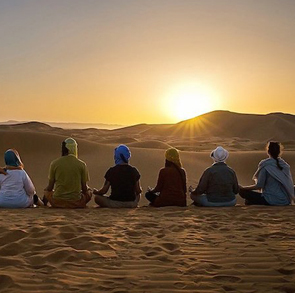 How could you miss out on the #1 desert tour from Marrakech? It should be at the top of your list of things to do when visiting Morocco. 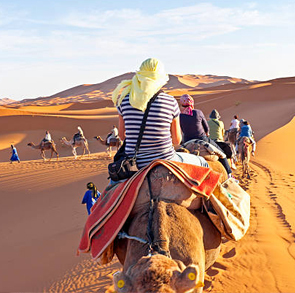 Marrakech tours is a company which organizes tours and trips to the Moroccan desert with its own tourist guides, in the most personalized way possible. Our Marrakech desert tours are planned to measure up to and ensure the interests of each group (couples, friends, families, etc.). We guarantee the best service, so travelers can enjoy Moroccan culture with all the satisfaction of the professionalism of our group. 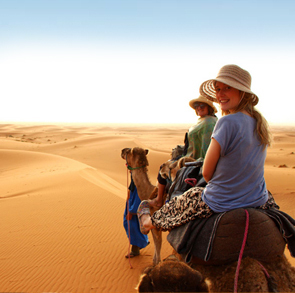 With fantastic Morocco desert tours, you can live unforgettable experiences. It’s an exciting country that captivates all who visit, enamoring all who have the good fortune to see it. Most of these Marrakech desert trips are in groups with other tourists with daily departures.